Three of the battle of the books finalists regrouped at the Festival of Literary Diversity for a conversation about race, representation and reading. Having a book on Canada Reads means big things for authors in terms of exposure, book sales and expanded readership. It can also mean one heck of an emotional roller coaster ride. Just ask Cherie Dimaline, Sharon Bala and Omar El Akkad. 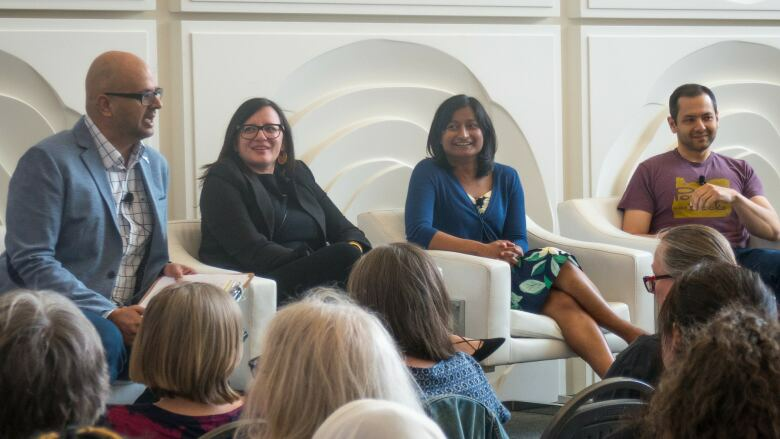 The authors of the three works of fiction featured on Canada Reads 2018 recently sat down with the show's host Ali Hassan at the Festival of Literary Diversity in Brampton, Ont., to talk about how it felt to see their books — The Marrow Thieves, The Boat People and American War — go head-to-head on a national platform. The other two books in contention were the memoirs Precious Cargo by Craig Davidson and Forgiveness by Mark Sakamoto. Forgiveness, which was defended by Jeanne Beker, was crowned the Canada Reads 2018 winner. A broadcast edition of the panel will air nationally on CBC Radio at 5 p.m. local time (5:30 p.m. in Newfoundland and Labrador) on May 21, 2018, and you can check out some highlights from the discussion below. Omar says: "The thing about Canada Reads is that there's two sides to it. There's the very pragmatic side for authors which is: I'm going to sell a ton of books as a result of this. And, if we're all being honest with ourselves, that's exactly what happened. Then there's the other side, which is the incredibly anxiety-inducing side." Sharon says: "This is my first book and I feel like Canada Reads is the reason it's on the bestseller list. It's the reason that many readers write to me or get in touch with me and tell me how the book connected with them. We get all this great publicity and all this great promotion and all our books together at the front of the stores, and then for one week we pay for it." Cherie says: "We were so Canadian about it. You know, they kept saying to us, 'Okay, when we take these photos, you're in competition. You need to show that you're in combat.' But we were like, 'I really love Sharon!' It was very Canadian and lovely, but it was fantastic. You can't beat it." Cherie says: "We had those larger conversations: Who really has the authoritative voice? Who's given the credibility? Who are the people that are seen as teachers and experts and authorities on issues? It brought up a lot of that. This is a conversation that we have in the Indigenous community and the storytelling community a lot — about what role gender plays and who has that power. It was clear to see that even if it was the women siding with men, it had to do with that ingrained belief that these are the people with the power: the people with the loudest voices and the highest platforms." Cherie says: "I have to tell you, the first time I watched it I cried. I cried because I was so incredibly proud of Jully. And I cried because of that idea that a Black woman can't speak with any sort of authority and power. That she is just an angry Black woman. That she is being too aggressive. That somehow she's attacking someone. I know this is a conversation we have in our communities and we talk about it — and now somebody said it out loud and it was an opportunity to respond and I think the way in which [Jully] responded was respectful, was intelligent and was just so powerful. I watched it after and when I'm having a bad day I go and I watch it again. It was so uplifting." Omar says: "I don't feel that novelists — that writers of fiction — are obligated to provide solutions of any kind. That's really important to me, because a lot of literature fails in that regard. The reason we keep bringing up 1984 and how relevant it is to the 'present' situation is because the message that 1984 was trying to convey keeps failing over and over and over again and we keep doing the thing that we were warned about over and over and over again. The important part is saying, 'Here. Here's a different outlook. Inhabit it for a while. Marinate in it for a while and see what you come out with.'" Cherie says: "I'm having these conversations with these kids and they're hungry for change. These are your kids and they're brilliant. I go into these classrooms and they say things like, 'How can I be a better ally without taking up Indigenous space?' This is a 15-year-old. They're ready to be allies. They're ready to learn things from other perspectives. I feel very privileged that through using fiction I was able to have these conversations." Sharon says: "When I wrote my book, I didn't know that it was going to get published. I never thought it was going to see the light of day, but I feel like, in retrospect, it's almost as though we've tricked people into learning about something they might never have learned about. And maybe even tricked some people — hopefully — into loving fictional characters and hopefully that'll translate into loving real people as well." Cherie Dimaline, Sharon Bala and Omar El Akkad's comments have been edited and condensed.